Andrew McCutchen is an All Star center fielder for the Pittsburgh Pirates and the leading candidate for the Most Valuable Player award in the National League. "Cutch" is rightly cited by many as a role model; raised in humble circumstances by hard-working parents, he is deeply involved with many charitable causes both in Pittsburgh and on a national level. Not only that—his talents extend to the visual arts. I recently issued an artistic challenge to McCutchen on Twitter, the results of which were fantastic. The man can draw. Turns out that he has always loved the arts—the challenge originated with an interview that my good friend Buster Olney did with McCutchen for ESPN's E:60. During the interview McCutchen discussed his talent for drawing and his desire to go to art school. This exchange got me thinking about other athletes who had artistic abilities and one name came to mind: Fred Gehrke. Fred Gehrke is recognized as the first designer to incorporate a logo or insignia on a professional football helmet. He was also a star running back for the 1948 Los Angeles Rams and a 10-year NFL veteran. An art major at the University of Utah, Gehrke joined the Rams in 1940. He worked as an aircraft technical illustrator for Northrop Aircraft in Los Angeles during World War II. Fred Gehrke liked everything about football except the leather helmets he and his fellow NFL players had to wear. "My gosh, I loved the game," says Gehrke, 76, who was a halfback and defensive back for the Cleveland/Los Angeles Rams during the 1940s and for the Chicago Cardinals and the San Francisco 49ers in 1950. "But those gosh-awful helmets we used to wear? At best, you'd have to call them dull." So one day after the 1947 season, during which the Los Angeles Rams had gone 6-6, Gehrke took matters into his own hands. Deciding that his teammates needed inspiration, he went to coach Bob Snyder with an idea. "I told him we needed to put some kind of design on our helmets," Gehrke says. "No other team had anything like that, and I thought it was time for a change." Gehrke, who had majored in art at the University of Utah, painted one of the team's brown helmets dark blue and then added the now familiar yellow horns. He and Snyder presented the helmet to the Rams' owner, Dan Reeves, who liked both the idea and the design. Gehrke took 75 helmets home with him that summer and decorated them all. He was paid a dollar for each paint job. 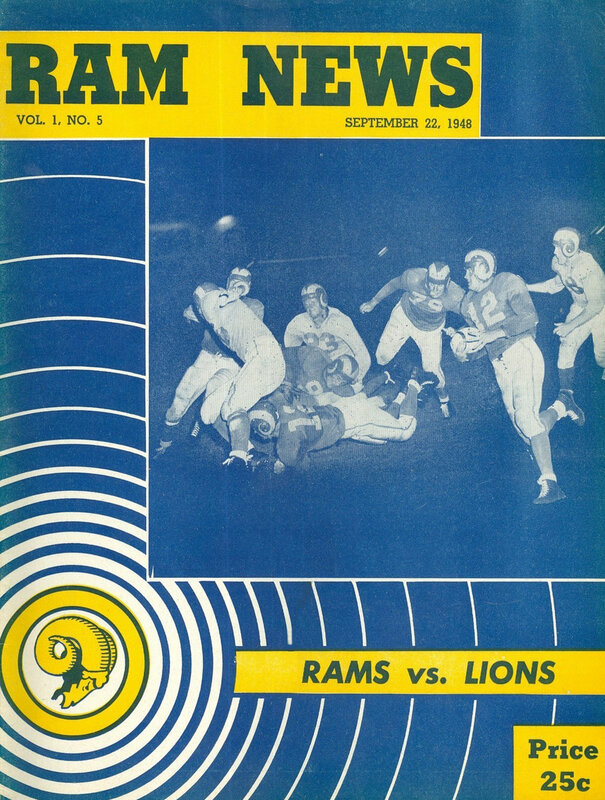 The article goes on to cite the first usage for the helmets as September 2, 1948, an exhibition game against the Washington Redskins, but that is not so-the following Los Angeles Times clipping shows that the Rams wore their new helmets in an in August 25 inter-squad scrimmage at Hollywood's Gilmore Stadium, attended by 11,205 fans. Gehrke was a versatile player for the Rams, playing both ways and returning punts and kickoffs. His versatility extended to the maintenance and care of the Rams' helmets—he said that "for two years I touched up the bonnets after every game. I kept a can of blue paint and a can of gold paint in my locker, and even took them along on road trips." 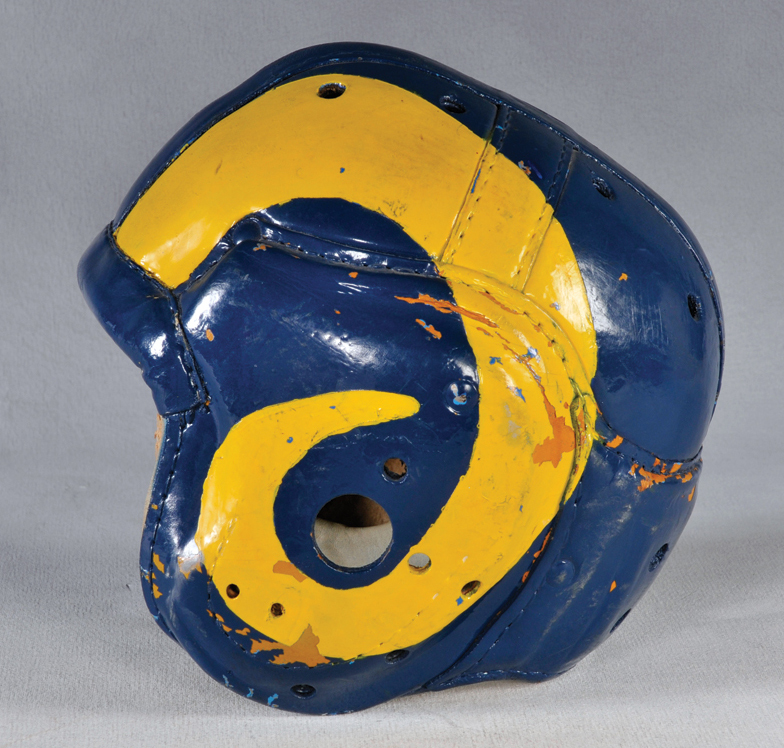 Riddell introduced plastic football helmets to the NFL in 1949—the Rams' horns were then baked right into the plastic, thus ending Gehrke's helmet repair career. He retired from the NFL after the 1950 season, then became a pro football scout and executive, eventually becoming the general manager of the Denver Broncos in 1976. He passed away at the age of 83 in 2002, his unique legacy as artist/athlete forever secure. In recognition of his Rams helmet design, the Pro Football Hall of Fame honored Gehrke in 1972 with the first Daniel F. Reeves Memorial Pioneer Award for a "significant, innovative contribution to professional football." The Sports Illustrated article further quoted Gehrke as saying the following: "I spent the better part of my life in football, and I'll be best remembered for some work I did with a paintbrush, but that's O.K. "I've been called the Da Vinci of football helmets, and that's not all bad."